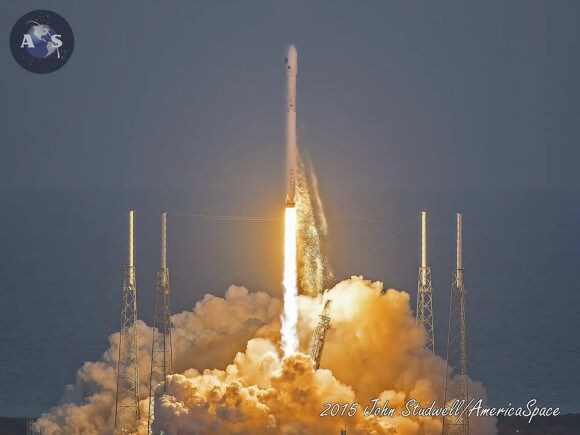 After a 17 year long wait, a new American mission to monitor intense solar storms and warn of impeding space weather disruptions to vital power grids, telecommunications satellites and public infrastructure was launched atop a SpaceX Falcon 9 on Wednesday, Feb. 11, from Cape Canaveral, Florida, to start a million mile journey to its deep space observation post. 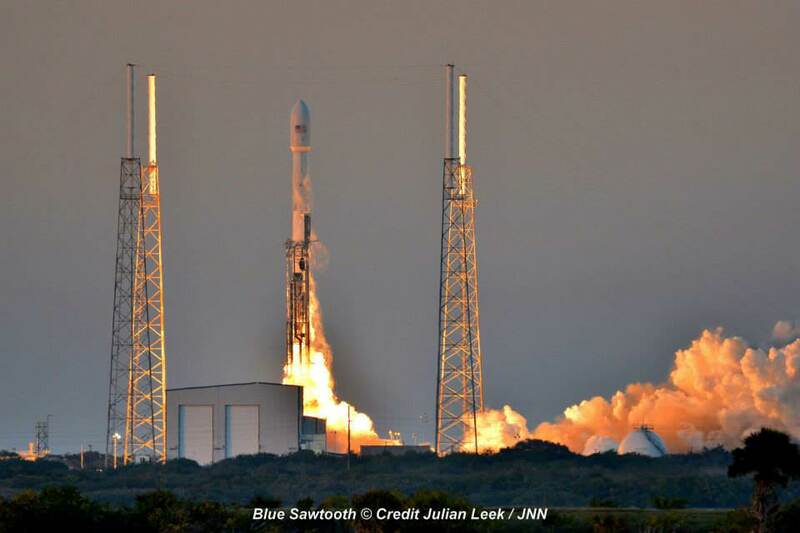 The third time proved to be the charm when the Deep Space Climate Observatory, or DSCOVR science satellite lifted off at 6:03 p.m. EST Wednesday from Space Launch Complex 40 at Cape Canaveral Air Force Station in Florida. The spectacular sunset blastoff came after two scrubs this week forced by a technical problem with the Air Force tracking radar and adverse weather on Sunday and Tuesday. 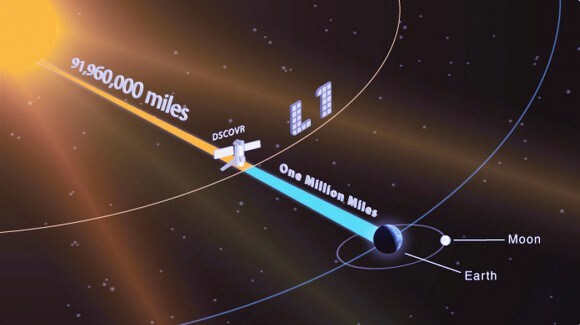 The $340 million DSCOVR has a critical mission to monitor the solar wind and aid very important forecasts of space weather at Earth at an observation point nearly a million miles from Earth. It will also take full disk color images of the sunlit side of Earth at least six times per day that will be publicly available and “wow” viewers. The couch sized probe was targeted to the L1 Lagrange Point, a neutral gravity point that lies on the direct line between Earth and the sun located 1.5 million kilometers (932,000 miles) sunward from Earth. At L1 the gravity between the sun and Earth is perfectly balanced and the satellite will orbit about that spot just like a planet. DSCOVR is a joint mission between NOAA, NASA, and the U.S Air Force (USAF) that will be managed by NOAA. The satellite and science instruments are provided by NASA and NOAA. The rocket was funded by the USAF. It will take about 150 days to reach the L1 point and complete satellite and instrument checkouts. DSCOVR will then become the first operational space weather mission to deep space and function as America’s primary warning system for solar magnetic storms. It will replace NASA’s aging Advanced Composition Explorer (ACE) satellite which is nearly 20 years old and far beyond its original design lifetime. “DSCOVR is the latest example of how NASA and NOAA work together to leverage the vantage point of space to both understand the science of space weather and provide direct practical benefits to us here on Earth,” said John Grunsfeld, associate administrator of NASA’s Science Mission Directorate in Washington. The 750-kilogram (1250 pound) DSCOVR probe measures 54 inches by 72 inches. The two Earth science instruments from NASA are the Earth Polychromatic Imaging Camera (EPIC) and the National Institute of Standards and Technology Advanced Radiometer (NISTAR). EPIC will provide true color spectral images of the entire sunlit face of Earth at least six times per day, as viewed from an orbit around L1. They will be publically available within 24 hours via NASA Langley. 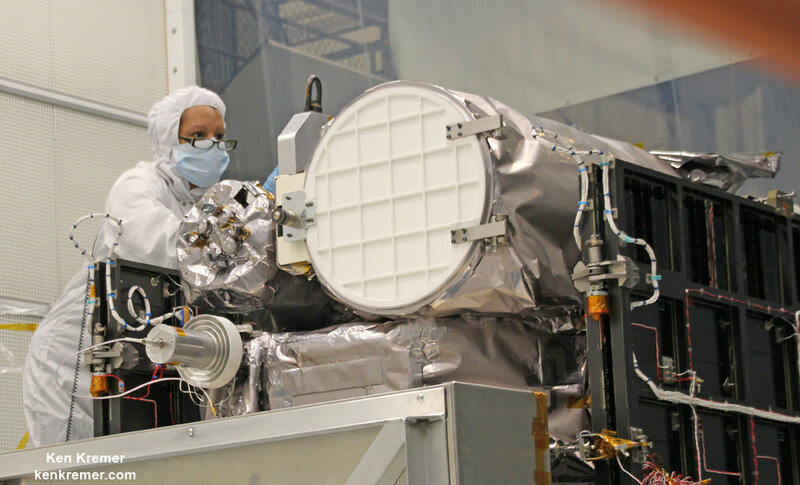 It will view the full disk of the entire sunlit Earth from sunrise to sunset and collect a variety of science measurements including on ozone, aerosols, dust and volcanic ash, vegetation properties, cloud heights and more. Listen to my post launch interview with the BBC about DSCOVR and ESA’s successful IXV launch on Feb. 11. 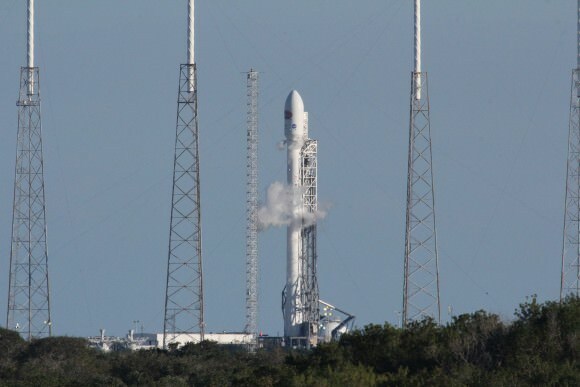 A secondary objective by SpaceX to recover the Falcon 9 first stage booster on an ocean going barge had to be skipped due to very poor weather and very high waves in the Atlantic Ocean making a safe landing impossible. The stage did successfully complete a soft landing in the ocean.